Dr. Jiliann De Villiers, affectionately known to her students and families as “Dr. Gigi”, is a veteran of the Miami-Dade County Public School system. Dr. De Villiers began her career in 1988 as an Exceptional Student Education teacher working with children diagnosed with Autism, Down Syndrome, multiple physical impairments, and Specific Learning Disabilities. She was among the pioneers who began implementing an Inclusion model for servicing children with special needs in the general classroom. In 1994, she left the classroom to become a Staffing Specialist. In that role, she was responsible for assisting in the diagnosis and placement of students with learning problems as well as designing educational programs to meet their individual needs. During this time, Dr. De Villiers helped to establish support programs for children with disabilities and their families across several schools in the county. In 1997, she worked as an elementary school administrator. Never losing sight of her love for helping children who face learning challenges, Dr. De Villiers developed special intervention programs at her school that targeted children whose educational needs were not being met by the school system. Luis De Villiers, affectionately known as “Coach Luis” joined his wife in 2004 when they opened the Exceptional Student Education program at Highpoint Academy under the leadership, support and vision of the school’s principal and owner, Alicia A. Casanova. Dr. De Villiers has used her years of experience and training to design the program and services offered at the school. Luis De Villiers coming from Corporate America, brought to the program the expertise for organizing different disciplines under one roof in order to provide in house services for the students and their families. In 2009, Luis and Gigi opened Schoolhouse Preparatory. This is first high school in Dade County designed for students with learning differences seeking a standard diploma. The high school has successfully transitioned their graduates to colleges across the nation with full scholarships and prepared them for life after high school. Dr. Gigi and Coach Luis both experienced first-hand the challenges that students with special needs face as they transition into adulthood, as well as the limited options that their parents have. Following their passion for making the difference in the lives of children, they fulfilled their dream of establishing a high school that meets the academic, social, and emotional needs of young adults, as well as support for their families. Their lives have been touched by every child and parent they've met along this journey. They’ve shared tears of pain, and tears of celebration when simple milestones that mean so much have been achieved. 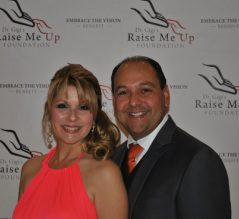 The story behind each child and their family has been the inspiration for them to create the Dr. Gigi’s Raise Me Up Foundation. The De Villiers family’s vision through “Dr. Gigi’s Raise Me up Foundation” is to provide much needed FREE programs and services, and bring healing and support to families of special needs children. Every dollar raised goes directly to the children and families the foundation services. You too can embrace their vision by supporting their foundation and leaving an imprint in the life of a special needs child.